← So, This Blog Has Some Sort of Simpsons Theme? Marge: Every father thinks his daughter is the cutest. Homer: Well, now there’s a way to prove it. Check out their enormous googly eyes! By the way, American Robins often lay an unfertilized egg, so the four/three mismatch doesn’t necessarily mean someone didn’t make it. It’s also possible these three are sprawled on top of Sibling Four! This is one of my favorite before and afters! 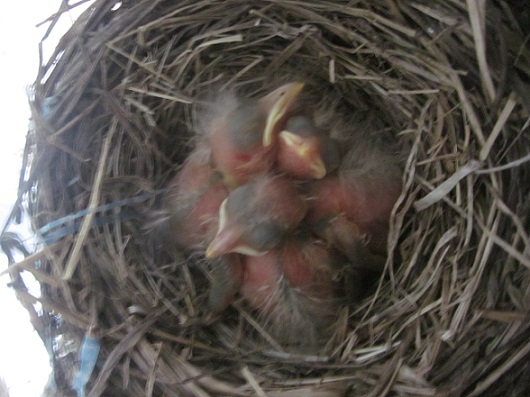 Update: As of 18 June, all three robins were fully fledged and out in the big wide world! Good lucky, Larry, Moe and Curly! 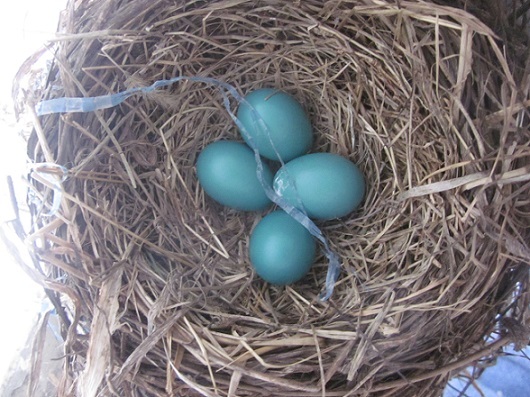 This entry was posted in Before & After, Porch, Yard & Garden and tagged baby birds, nesting birds. Bookmark the permalink.